Last week, the East Aurora Runners celebrated the end of our first ‘Winter Warrior Challenge,’ a 16-week contest to see who could attend the most runs, no matter the weather. Pictured below are our winners, two couples who are die-hard runners. Sarah, far left, is pregnant and got this cute onesie in her gift bag! I came in second, with another runner, as I missed ONE RUN due to my varicose vein removal in December. I think I should have gotten a pass for that one, but whatev 🙂 There’s always next year! 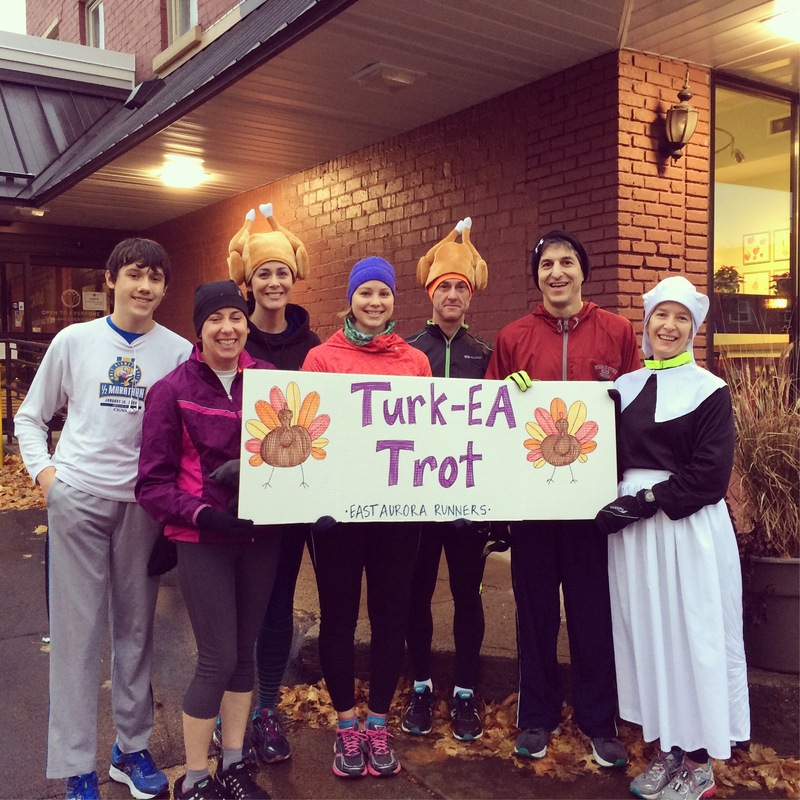 I’ve been running with the group since sometime in 2013 and even wrote an article on us that was published in the East Aurora Advertiser in February of 2014. Debbie, pictured below left, started the group in December of 2012. I missed about half of last year due to a bulging disc, but have been going strong since July. The photo below is of some of the earliest runners in our original shirts. Since then, we’ve gotten t-shirts from 42 North (gifted to each runner after 10 runs) and neon jackets to promote visibility on our evening runs. This group has grown from just a few women meeting in a parking lot to 20+ runners each Thursday night. (I credit much of that to ‘upgrading’ our meet-up location at 42 North…) I’ve gotten to know some of the runners fairly well and we meet up for additional weekend runs and even movies (!!). What was once for me (albeit for a short time) an ‘optional’ workout is now a singed-in-ink weekly date on my calendar. We’ve run in rain (in fact, the night of our party was the wettest run in a long time), snow and heat, but it’s not even about the weather. It’s about the company of others who are like-minded and genuinely interested in building relationships. 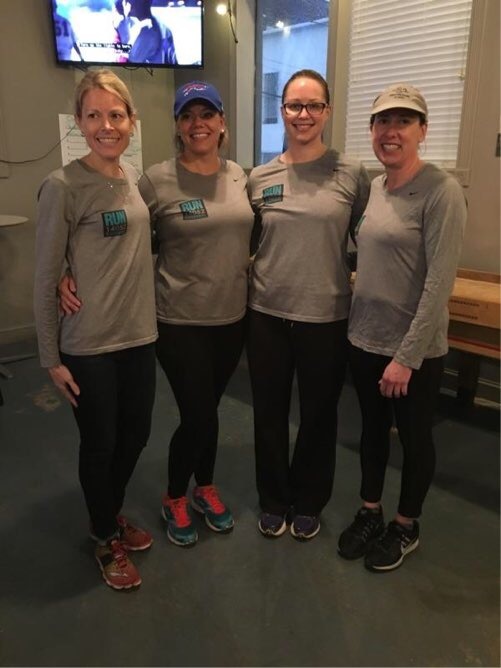 If you’re local and a runner, come out and meet us each Thursday night at 6 p.m. at 42 North–I promise you’ll have a group of friends almost instantly! 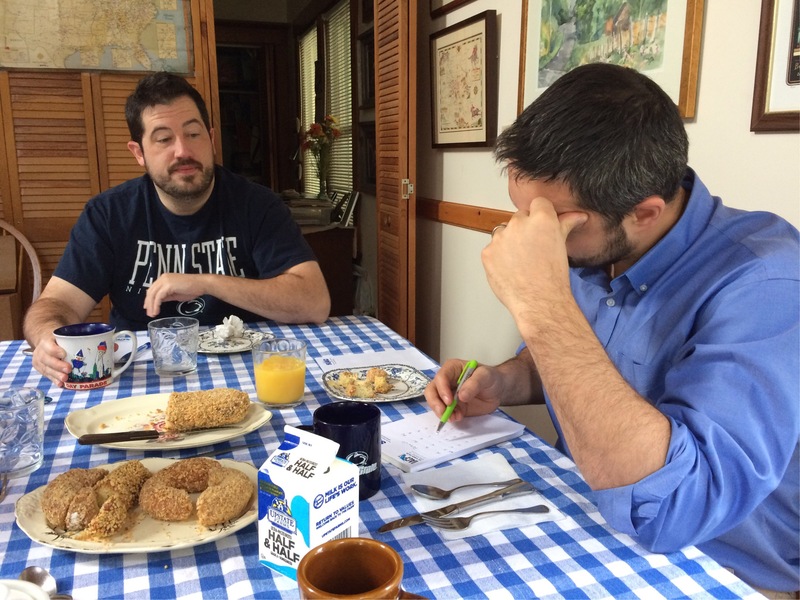 This past weekend, Andrew and I did a donut ‘taste-off’ with the Nyes (minus Mrs. Nye, who had to go to church early that morning), something we’d been talking about for quite awhile. 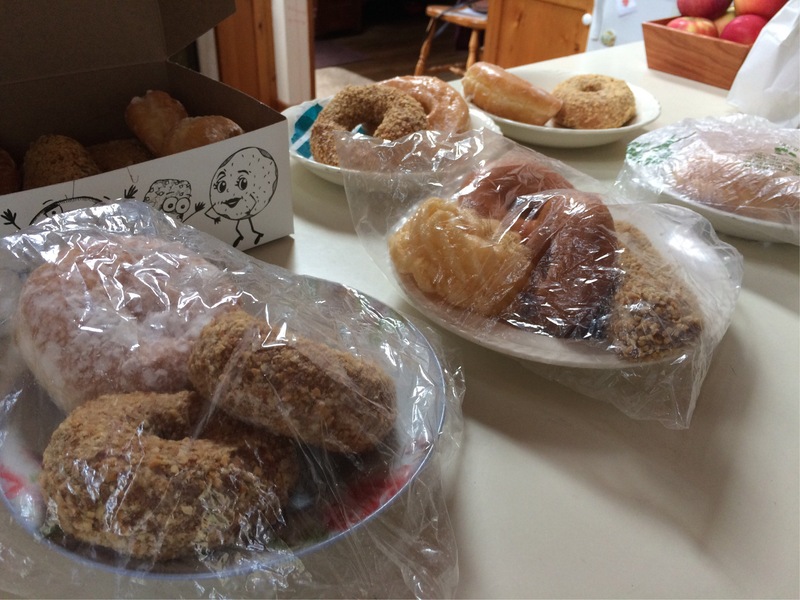 Mr. Nye has always raved about the peanut donuts at our local Tops, and–of course–Paula’s is a sensation for sure. I’d been excited about this event since we started planning it. We decided to include both Dunkin’ Donuts and Tim Hortons as ‘controls’ of sorts, as well as Tops and Paula’s, and threw in two more ‘dark horses’ for good measure: Donut Kraze, a tiny 24-hour donut & coffee place Andrew and I discovered and hit-up every once in awhile when we’re in Buffalo, and Eileen’s, a West Seneca bakery the Nyes like that makes excellent birthday cakes. Donuts to be taste-tested included peanut and plain glazed, as peanut donuts are the Nyes’ favorite, and glazed are Andrews.’ He’s a picky one, that man. We ended up with five total for each flavor category, as Tim’s didn’t have a peanut donut and Tops didn’t have a glazed. I facilitated the tasting, beginning with peanut. I cut one donut from each location into small pieces and any extra was lined up on a platter in the order in which it was presented in case people wanted more of a particular one. We each scored the donuts as we liked (Professor Adam used letter grades, I used a scale from 1-10 and gave each a range with comments). Andrew tallied up all the scores–can’t you just see the steam coming out of his ears?? Peanut: Donut Kraze, Eileen’s, Paula’s, Tops, Dunkin’ Donuts. Glazed: Donut Kraze, Eileen’s, Tim Horton’s, Paula’s, Dunkin’ Donuts. Boy, aren’t we glad we included both Donut Kraze and Eileen’s! In reviewing my personal notes on the peanut donuts (I didn’t really participate in the glazed testing, as I don’t really like them anyway and didn’t want to waste the calories. ), I liked Eileen’s the best, followed by Donut Kraze, which I noted to have a ‘peanut butter’ flavor, followed by Paula’s, which had a hint of cinnamon. We also got to taste a couple other offerings from these places, including French Crullers from Dunkin’ and Tim’s (both of which were awful–way too much glaze), Paula’s red velvet (my personal favorite–basically a red velvet cake in the shape of a donut) and a cinnamon ‘bun.’ I also love sour cream donuts, and I can only assume our winning locations would be the best places to get them. Thankfully, we pawned off all the leftovers on family members after church, so I wasn’t plagued by donuts all week, praise God. Also, neither of our winning locations (Donut Kraze and Eileen’s) are in East Aurora, nor are they even places we drive by very often, so there isn’t really a danger of starting a habit of stopping for donuts.